If good design is functional and visually appealing, great design is also ingenious and unexpected. Especially when it comes to ceilings – often overlooked and impersonal – choosing unique solutions has a powerful impact. In fact, when treated with the attention they deserve, ceilings can turn into the focal point of a room and give a space a sense of distinction and splendor like no other element of design. Here are a few excellent examples that make smart use of lights to recreate a space. 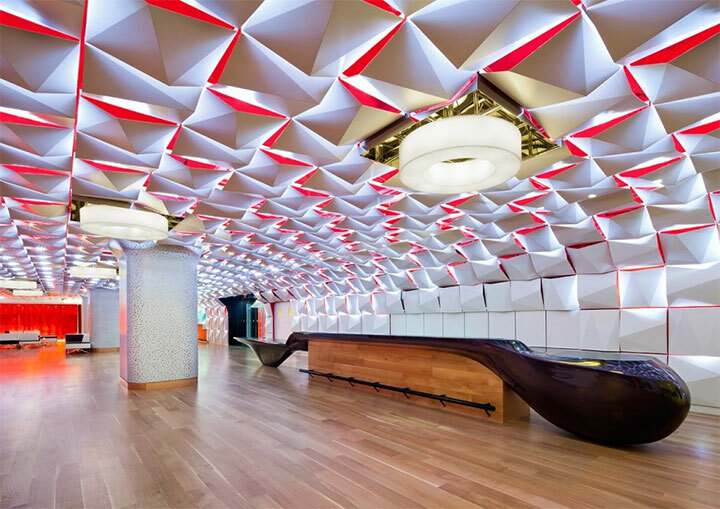 A geometric design and a contrasting white-and-red chromatic combination take the ceiling of the Salon Urbain in Montreal to a dramatic level. The space is a former parking area transformed by Sid Lee Architecture and Aedifica into an urban lounge located in Place des Arts. It serves as a place to meet before and after attending a concert in the music hall, visiting a gallery or attending a conference. 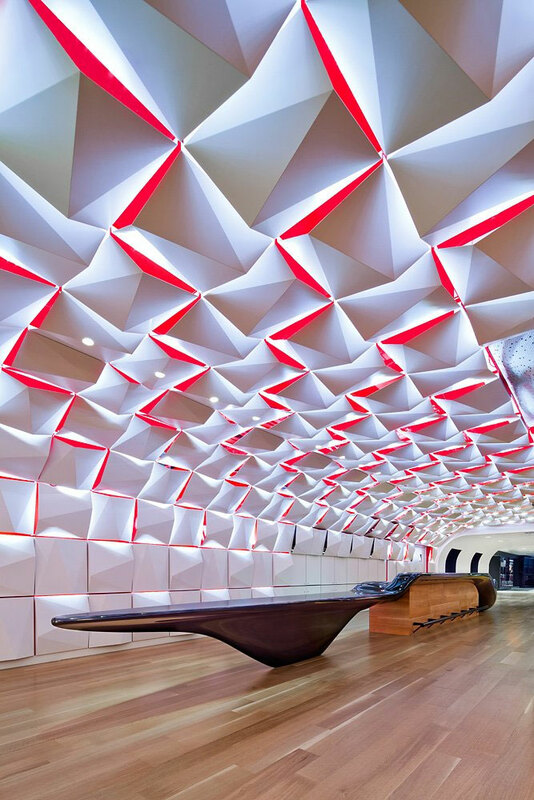 Meant to be inspiring and artistic, the ceiling uses red as the color that calls to mind the image of raising curtains and performance nights. The geometric design allows for a clever mix of lights and shadows, reminiscent of the mysterious nature of the arts, revealing and enigmatic at the same time. Designed by Tokyo-based Igarashi Design Studio, Tsumori Chisato’s Shangai Boutique is the architectural counterpart of the elaborate clothing creations dreamed up by the well-known Japanese fashion designer. The space, resplendent with gold tones, is completed with a ceiling whose small lights echo the shape of the tables. The result is a cohesive space, where different elements of design seem to communicate with each other. The high ceilings of the Studio M Hotel in Singapore are an opportunity to make a statement. 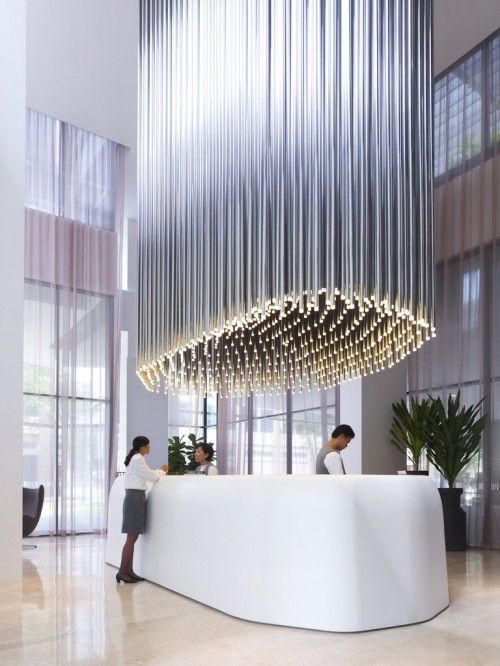 A collection of svelte pendants is cascading over the reception counter, mimicking its shape and placing it in the spotlight. 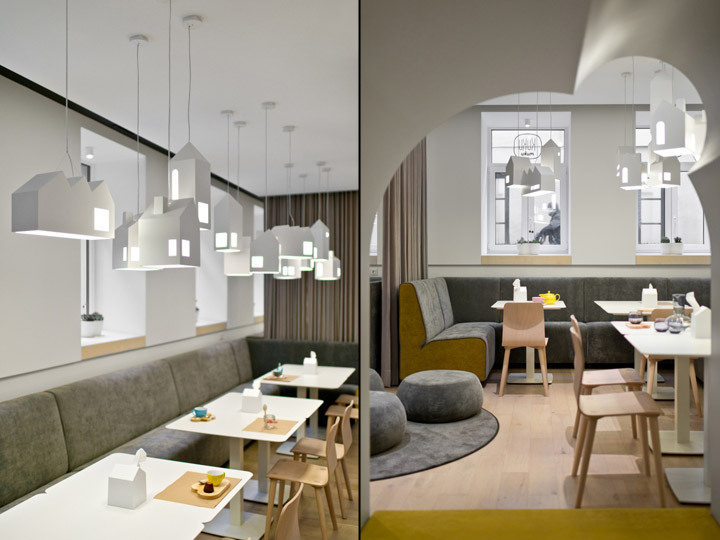 Finally, Kukumuku, a restaurant-theatre for families with kids, located in Vilnius, Lithuania, and designed by Plazma Architecture Studio takes a playful turn with lighting. White luminaries in the shape of houses that are placed above the tables create the appearance of a floating city for a warm fairy-tale atmosphere.